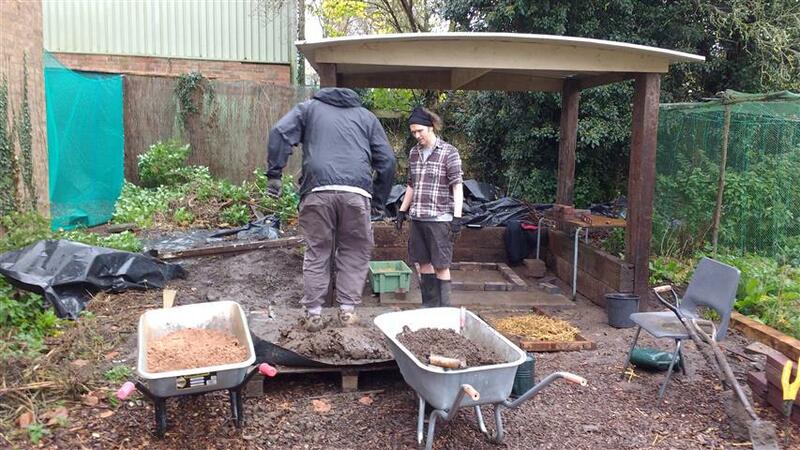 We have been working hard down at GraceWorks on the foundations of our Barrel Oven. A Barrel Oven is a versatile wood-fired oven that is relatively easy to build and easy to use. It can be the seed for a small-scale baking enterprise or the heart of a community’s wood-fired cuisine. All kinds of food can be baked in the Barrel Oven including bread, roasts, pizza, cookies cakes, pies, casseroles and stews. The Barrel Oven offers surprising convenience because it is hot and ready to bake in within 15-20 minutes of lighting a fire. Another great feature is that it is easy to maintain at a desired temperature for long periods of time. This type of oven is often called a “mixed oven” because it has the capability to cook with direct as well as stored heat. 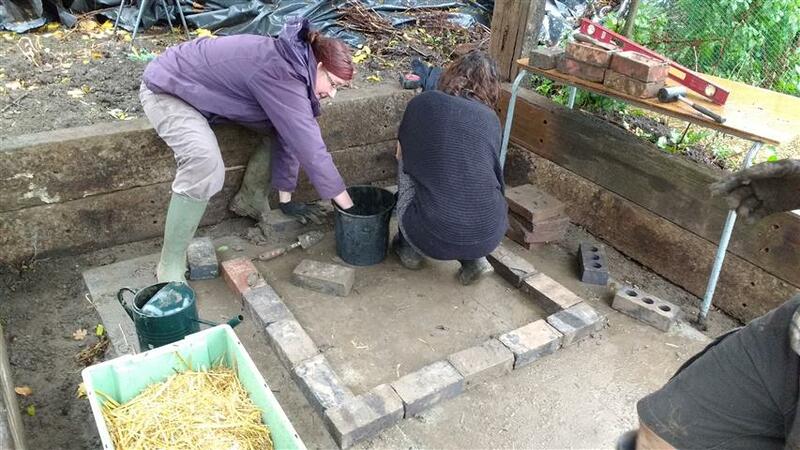 The Barrel Oven can be built almost entirely out of recycled, re-sourced and local materials we have been scavenging, sleepers, paving slabs, bricks & roofing for the project. We've had a great weekend in November going over to The Grange. The Grange is a family home and smallholding where Ben, Soph & Ori live and work is West Norfolk. 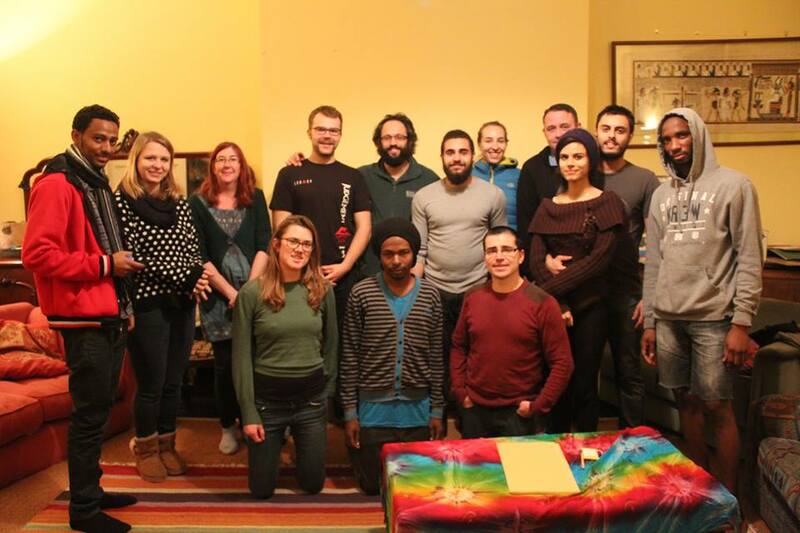 It is a Permaculture Land Site but has a particular focus on hosting people who have survived torture and extreme violence and those fleeing persecution. 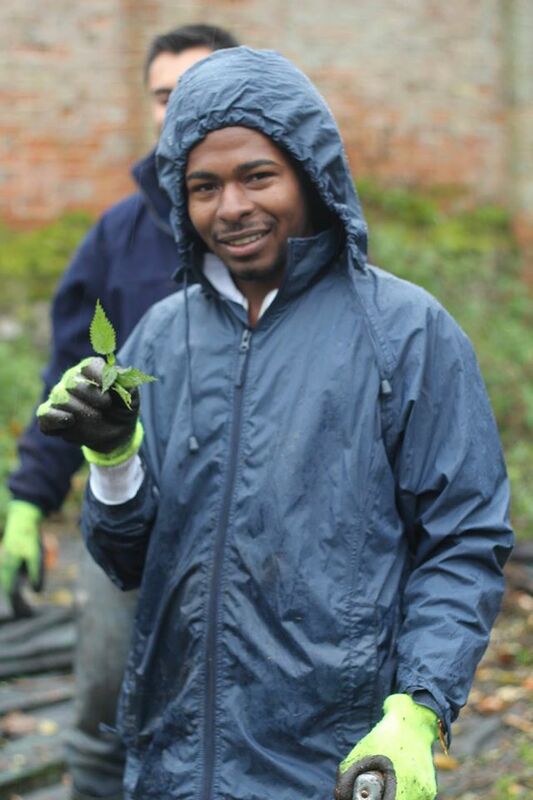 When we visited it was pouring down with rain but Ben had us out working preparing the forest garden area with friends from Norwich New Routes and Rosa from Norwich FarmShare coming together for some hard work on the land and lots of good food and fun! Well, what a fantastic day we all had at 105 Scraptoft Lane at Graceworks first Apple Day. A big thank you to everyone who came and joined in with Graceworks first Apple Day celebration, we hope you all had a great time. Dani Pattuzzi lead the day showing us how to gather, process and press the apples in the wonderful Oak Press. The press is owned by Transition Leicester Apple Press which comes with a pasteuriser, so that you can preserve your juice in glass bottles for the year ahead. Once pasturised, the apple juice will keep for a year and still be far more delicious than anything you can buy. 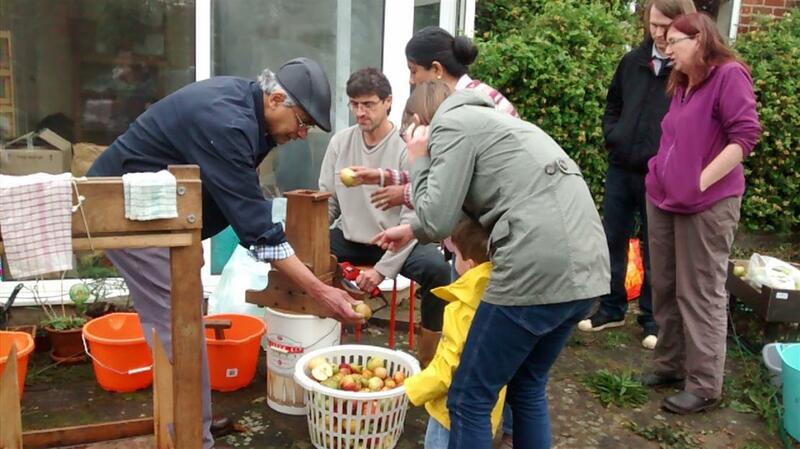 We had people from age 2 to 70 washing, pulping and pressing apples and we pressed over 80 litres of apple juice. At the end we also made some fresh pear juice as well. As well as all having an abundance of apple juice to take home with friends and family we filled a barrel up for the Real Junk Food Project for their meal tomorrow night. We hope everyone enjoys their juice. Friends Meeting House, Queens Rd, Leicester, LE2 1WP. > coldframes from old drinks bottles. Talks and workshops ranging from, “Using Linux to give dying computers new life” to “Consumers anonymous – tackling your addiction to stuff and things”. Children’s activities including making a city from cardboard boxes and marble run from old plastic bottles. Swap / bring and share stalls for fabrics, craft materials, bike lights and fittings and more. 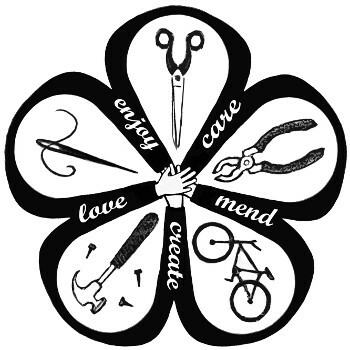 The day’s emphasis will be on fixing and creating things with secondhand and reclaimed materials – we want to introduce people to exciting ideas for being crafty and ingenious in an environmentally friendly way. Sleepers Going Up . . .
Today we got the sleepers in place ready for the roof of the barrel oven area. 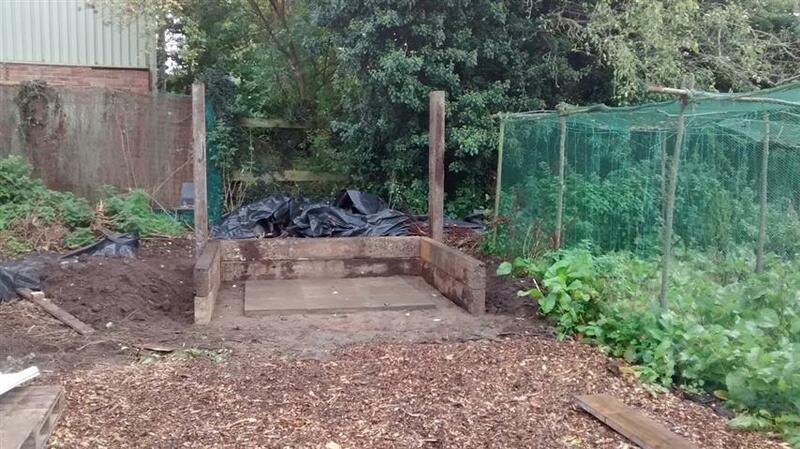 We are building a 3 meter covered area for the outdoor cooking to take place. It is all starting to come together. We can't wait to be making our own fresh bread and pizzas. Evington, Leicester, LE5 6EA .